We are popular as the prominent manufacturer and exporter of the pipe and joint system. It is highly demanded for various purposes like storage and displaying. It is very preferable system due to its diverse rearrangement property. It is excellent example of lean manufacturing. The pipe and joint system can easily rearrange as per desire without any special technical skill or specific tools. We manufacture this pipe and joint system from high grade steel. The plastic resin coating is applied to steel pipe. The outer surface of the pipe is applied to ABS plastic coating. Antirust coating to inner surface of pipe make it more strengthen. These coated pipes are of 28 mm diameter and thickness is 0.8 mm/ 1.0 mm. 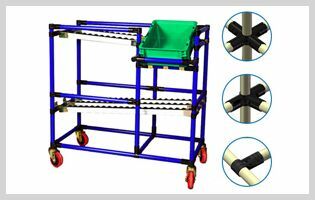 This multipurpose pipe and joint system can be arranged to make racks, trolleys, workstations and many more. Casters are also provided for the mobile applications. It is too simple and easy to install, adjust, modify and alter. This all in one system is available with industry leading prices. Recyclable property of the system makes it eco-friendly product.